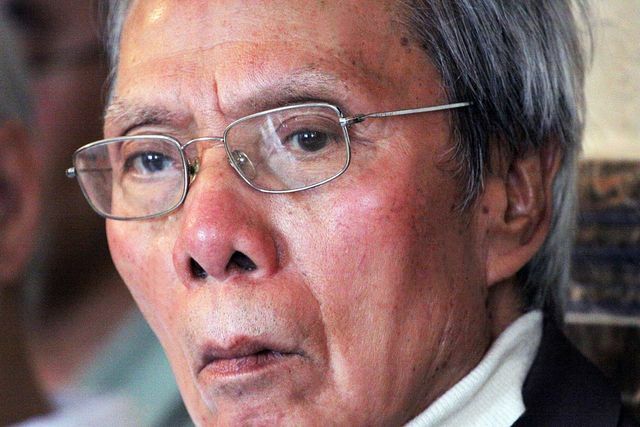 The passing of a major Vietnamese dissident writer–silenced in Vietnam, acclaimed in the free world–is mourned by a friend and champion. Nguyen Chi Thien’s story of serial imprisonment and resistance is a parable of artistic choice for a not too distant generation. Early on Tuesday, October 2, 2012, Nguyễn Chí Thiện, Vietnamese dissident-poet, passed away quietly at 73 in a Santa Ana hospital after refusing life support. Of all of Vietnam’s prisoners of conscience, he had one of the longest overall sentences, spending a total of 27 years in various prison camps in North Vietnam. Born in Hanoi in 1939 to a family of 6, his elder brother, Nguyen Cong Gian, enlisted in Vietnam’s National Army and was the only family member to move South, later rising to the rank of lieutenant-colonel in the ARVN. After 1975, Cong Gian would also be imprisoned, spending 13 years in Hanoi’s reeducation camps. In 1954, Thien initially welcomed uncle Ho’s Viet Minh soldiers as liberators, but he and his family later regretted their earlier and short-lived exuberance. In 1960, while substituting for a friend, he explained to a classroom that the Soviets did not end WWII by defeating the Japanese army, as stated in their textbook; but rather the United States and the two atomic bombs dropped on Hiroshima and Nagasaki. This landed him in prison for three and a half years. In prison he began composing his poems in his head, committing them to memory by reciting them to his jailmates. In 1966, he was incarcerated again, this time for more than 11 years because his ‘reactionary’ poems circulated in Hanoi and Hai Phong. Released in 1977, 2 years after the fall of Saigon, he lived under constant police surveillance. In 1979, fearing that he might not survive a third prison term, he was determined to smuggle his poetry out of Vietnam. Thien boldly entered the British Embassy in Hanoi, requesting asylum. Though his request was denied, British diplomats agreed to deliver his collection of 400 poems out of Vietnam. Thiện walked out of the embassy and spent the next 12 years in prison, mostly at the infamous Hanoi Hilton. His poetry first appeared in the U.S. in the early 1980’s under the title “A cry from the Abyss”, before being published as “Flowers from Hell”. The collection was translated into English, French, German, Dutch, Spanish, Chinese, Czech and Korean. Thanks to his international following, Thien won the Rotterdam’s International Poetry Prize in 1985. In 1988, he also won the “Freedom to Write” award from Pen International. After the collapse of the Soviet Union, he was finally released in 1991 and resettled in the U.S. in 1995, the same year he was honored by the Human Rights Watch. Like many Vietnamese, I took up his cause as a student at Cal in the early 1980’s. We organized poetry recitals on university campuses throughout the Bay area to raise awareness about the prisoner-poet and Vietnam’s repressive state of morose socialism. This was the beginning of our friendship. de ce qui est dans mon cœur? s’il me faudra mourir encore ? – Es-tu fou mon petit ami? Dis? Que diras-tu au Bon-Dieu? il y a de grandes misères. – O ami, je suis ta Mamore. De ce qui est dans mon coeur? Ne guérit pas de sa blancheur. Làm sao chu*a duoc bênh trong tim? Tuyet trang có khi nào tâ?y duoc màu tinh khôi cu?a nó? Must I die once again? Are you crazy dear friend? Do tell? What will you say to the Good-Lord? My friend, I am your Love. In Heaven, there will be our love. Of this thing in my heart? Can never be cured of its purity. Poetry still shoots, with plenty of power and bullets! And break down the rusty steel and metal of the enemy! Mà là tiếng cuộc đời nức nở! Tiếng khò khè hai lá phổi hoang sơ! Tiếng đất vùi (mộ) đổ xuống lấp niềm mơ! Tiếng khai quật cuốc đào lên nỗi nhớ! Tiếng răng lạnh đập vào nhau khổ sở! Tiếng dạ dày đói lả bóp bâng quơ! Tiếng tim buồn thoi thóp đập bơ vơ! Tiếng bất lực trước muôn ngàn sụp đổ! Có phải em là em bé? Bố tập trung xa cách đã mười năm? Là đồng chí bí thư nơi mẹ em công tác? – Ít ký ninh, ít đường đen bồi dưỡng! Hãy nín đi em đừng khóc! Là cháu ngoan bác Hồ em có thích không? Are you not the child? Whose father regrouped 10 years ago? He is the comrade secretary where your mother works? A bit of quinine, a little black sugar to eat! Uncle Ho’s well-mannered child, would you like that? Một tay em trổ: Đời xua đuổi! Một tay em trổ: Hận vô bờ! Thế giới ơi! người có thể ngờ? Đó là một tù nhân tám tuổi! Tôi gặp hàng ngàn em bé như em! A tattoed arm: Life Gone! A tattoed arm: Infinite Hatred! Oh world! Who would have imagined? I have met thousands of children like him! If Nguyen Chi Thien’s story is both extraordinary but also typical, how many among us has been touched by Vietnamese poets, writers, artists who have labored in obscurity?